Leamington Spa based, building services design consultants, Greenway & Partners are proud to announce 45 years in business, and to mark this milestone birthday the Company has chosen this occasion to re-launch its image with a new green initiative and new addition to the team – Zoe. Zoe is a brand new, 100% electric Renault Zoe, recharged whenever possible using renewable energy sources and she is key in showcasing Greenways recent brand overhaul to the local area. 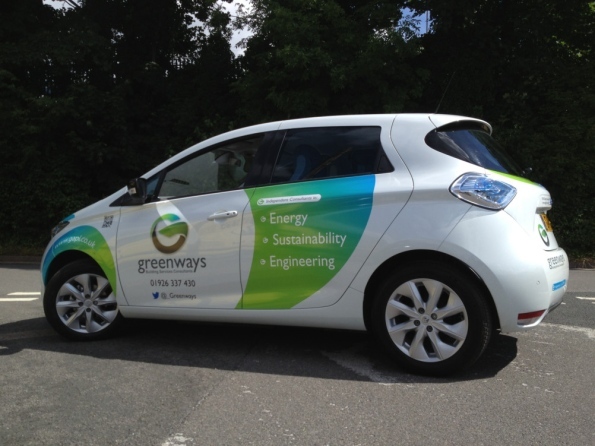 You may already have seen Zoe driving members of the Greenways team around Leamington, Warwick, Stratford and Coventry, sporting their new company branding and moving around our towns without causing any noise or pollution. Throughout the last 45 years Greenways has concentrated on working with the most up to date techniques, in all aspects of electrical & mechanical services design and renewable engineering, providing Clients with innovative, energy saving, sustainable solutions. More recently the emphasis on these energy saving principles has become stronger than ever. Greenways energy efficient and cost effective electrical & mechanical designs have been installed in flagship buildings throughout the Country including: The new £9M refurbishment at Warwickshire College, Warwick School, Ashorne Hill Conference Centre, LSE London, Brit School London, The new Production Facility at Penso Coventry and The Civic Hall in Stratford upon Avon. More recent Clients that have used “the Greenway” include Premier Foods, Coventry Transport Museum, Listers, Spitfire Property Group, NHS, NFU Mutual and a number of local Architects.